We have all seen it, at least in the news. Most of us have been impacted by it because it is all around us. Extreme weather events have increased in intensity. Our climate has changed and as the modelers said 30 years ago, extremes have increased. In the future, expect further increases to triple what we see today. Droughts are longer and deeper. Floods are bigger. Tornado outbreaks have more tornadoes in them. Hurricanes in the Atlantic Basin have increased in intensity and in frequency. These things are real and backed up by science. What is not real in the science (yet), and is poorly communicated by the media, is that intensity of tornadoes and number of outbreaks shows no statistical increase yet, hurricane intensity and frequency globally shows no increase yet, and more extreme winds from non hurricane wind storms show no increase yet. “Yet” is the important part of these statements. Rare things take time to become statistically valid in our climate. That these few extremes are not yet 100 percent verifiable is something that is used to obfuscate the rest of the science, sometimes on purpose, and sometimes out of what journalist perceive to be fairness. 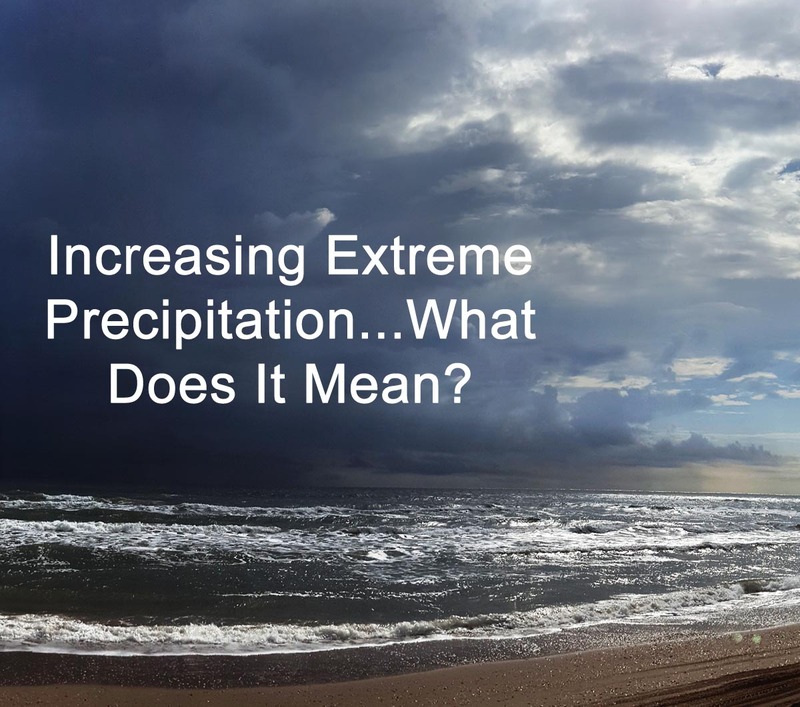 The rest of the story: The reasons some extreme weather types shows no increase yet include the aforementioned rareness, and the difficulty of data acquisition and robustness of historic data. It doesn’t mean the intensity and frequency of these things are not increasing, it means that “for certain” the statistics are not robust because of “noise” in the system. We can’t see the truth because of the inaccuracies inherent in the data: we can’t very well measure all tornado’s wind speeds; the number of global hurricanes is far greater than the number of Atlantic hurricanes and this skews the global average; data collection and evaluation for small storms is problematic because of the very large number of events and advanced nature of data collection via Doppler radar. We are getting there, and we are getting there sooner rather than later because of the advancement in computer speed, data collection and evaluation research. Modelling too is an important tool in understanding extreme weather. In the past we have not had the tools to model small scale storms. So, we did not definitively understand how small storms would behave on a warmer planet. Now we have modelling to back up the actual increases in extreme weather events we have been seeing lately. 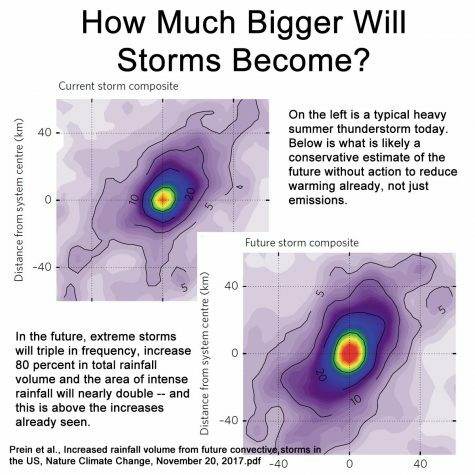 This research looks at small mesoscale convective system (MCS) storms (very large summertime thunderstorms). These are the big thunderstorms (60 miles across) that pop up with summer heating and last a relatively long period of four hours or more. This work used the most advanced convection enabled modeling to explore these MCS storms during June, July and August with business as usual (BAU) warming by end of century. What’s important to note with this research and all modelling, is warming is out ahead of emissions. This can easily be seen with warming over the last five years. During this period, global emissions have stagnated, but warming continues at it’s most rapid pace yet. The reasons warming continues are that emissions continue of course, and also that the global temperature is still catching up to the ‘warming in the pipeline.” But the reason that warming is accelerating is that feedbacks have kicked in. The warming arctic is probably the biggest of these feedbacks, though globally, early spring and late autumn onset have big feedback effects too. Anywhere there is less snow on the ground, warming is amplified by about nine times because dirt, plants, rocks and water soak up nine times more heat than snow. Understanding that warming can accelerate while emissions do not increase is very important in interpreting climate modeling. When we see worst-case warming by the end of century in model projections, and we interject in our minds that “surely, we will get this deal under control,” we need to understand that even if we fully implement Paris emissions reductions of 80 percent by mid-century and net zero by 2080, we still warm up to triple the observed warming by mid-century and quintuple by 2100. It’s also really important to understand that modeling and consensus guidance understates–in some cases dramatically. Antarctic ice loss for example: As recently as the 2007, the Intergovernmental Panel on Climate Change (IPCC) reported Antarctica was not supposed to begin losing ice until after 2100. The 2013 IPCC report however showed Antarctica had dramatically begun to lose ice at up to half the rate of Greenland. It’s not that Antarctica suddenly began to lose ice. First publishing on Antarctic ice loss was in 1996. The challenge is that consensus science–because of the consensus–compromises, and the results are understatements about projections. What these researchers from the National Center for Atmospheric Research found was that these intense summertime MCS storms will more than triple in North America; will see a 15–40% increase in maximum precipitation rates; and a significant spreading of regions impacted by heavy precipitation occurs with up to 80% increases in the total precipitation volume. The area covered by each individual storm increases roughly by a factor of two. Like all things climate, multiple by five or thereabouts. As frequency, intensity and area of coverage of extreme summer storms all increase at the same time, and as the volume of rainfall that falls on a particular place increases thus increasing flooding nonlinearly (a little bit more rain creates a lot more flooding); the astonishing amounts of flooding that we have seen lately will be eclipsed dramatically in the future. Prein et al., Increased rainfall volume from future convective storms in the US, Nature Climate Change, November 20, 2017.